I knew Vancouver’s Chinatown had been dying a slow death since the mid 1990s, as new pristine shopping centers for Chinese food and fare opened in Richmond and then later in Burnaby. The T&T supermarket chain certainly hastened the decline of Chinatown as well. Despite working only a 15 minute walk away for the last 12 years, I would only venture as far as the T&T, preferring its organized aisles and bilingual signage, for my Chinese grocery needs. Nonetheless I was still shocked and saddened to see the vacant storefronts and absence of people on the sidewalks as I wandered into Chinatown looking for a family size (1.5 or 2 litre) container of sweetened tofu pudding. I still heard the familiar sounds of mah jong tiles clattering together and dialects of Chinese that are neither Mandarin nor Cantonese, but the streets seemed deserted in comparison to the memories I have of a thriving Chinatown. I believe my peer group (Chinese in their late 20s to mid 30s, born & raised in Vancouver) may be the last generation to have memories of a full, busy and prosperous Chinatown as it is now. The throngs of families wandering the street picking up Chinese vegetables, fruits, groceries, cuts of meat and bake goods for their family dinners. I remember the village uncles working the BBQ station at Dollar Meats sneaking me pieces of crackling from the roast pig, the burnt ends of BBQ pork or bits of Chui Chow style cuttlefish when my parents weren’t looking as a kid. I also have fond memories of egg & ham buns that used real butter, spring rolls filled with bamboo shoots and wood ear fungus and silky smooth egg custard tarts from the numerous Chinese bakeries scatter within the confines of Chinatown. In retrospect, I guess I didn’t have a chance of not becoming a lifelong food devotee. 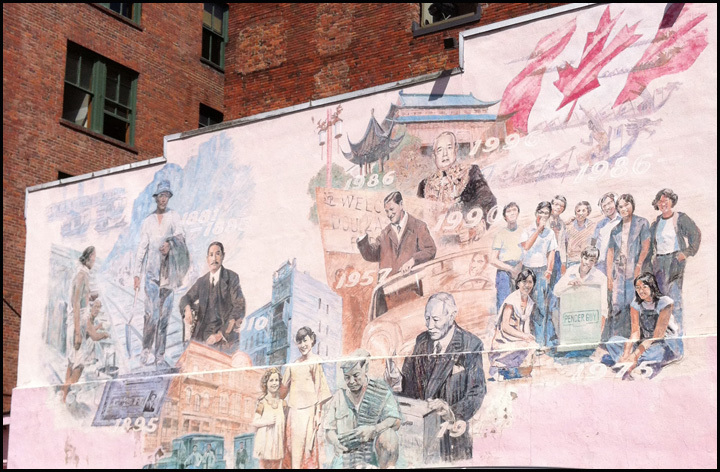 The original reason for Chinatown, a safe haven from the outright racism and prejudice against ethnic Chinese that was prevalent in the turn of the 20thcentury, doesn’t really exist today. Today, businesses have setup shop across Greater Vancouver providing consumers lots of options for Chinese specific ingredients and products. As a result, I understand Chinatown may never be able to return to its former glory as the commercial and cultural hub for all things Chinese in the city. However, I think it’s important for Chinatown to survive and thrive, not necessarily as a centre for general Chinese Culture but more importantly as a homage to what it means to be Chinese in Canada (which is different than what it means to be Chinese in General) and to those community elders who fought for equality for ethic Chinese in Canada. If the provincial election last May had occurred 67 years ago, I would not have been able to vote in it because my Chinese heritage. Even though I was born and raised in Vancouver, paid my taxes for the last 12 years and minded my Ps & Qs, I would not have been able to cast a ballot for a MLA and not even be recognized as a Canadian citizen. That was the reality of the Chinese who lived in Vancouver before 1947. 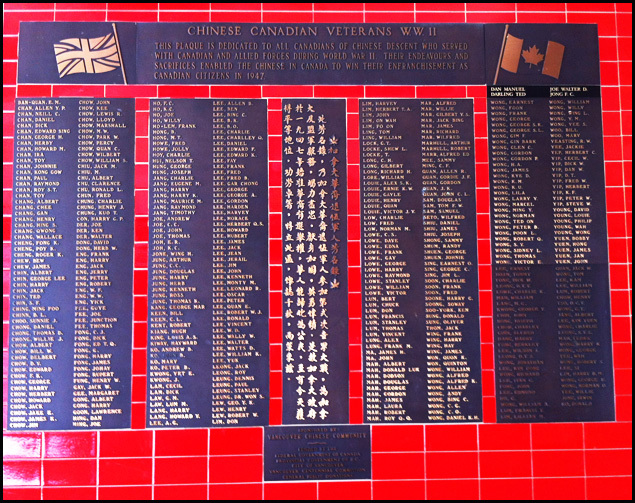 It took approximately 400 sons of Chinatown to enlist in the Armed Forces of Canada during World War 2, to provide the Chinese community leverage to fight for equal rights and citizenship with the federal government. 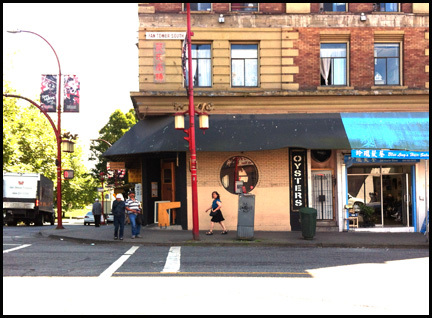 Given the recently collapse of the empty building on Powell street and the loss of the Pantage Theatre on Hastings Street, my concern is leaving buildings fallow in Chinatown will mean a potential loss of history and further degradation of the community. It’s easier to maintain a building if it is being used. The city of Vancouver has approved mid-rise residential development and an economic action plan in hopes of helping renew Chinatown. As it will take a few years for the residential development to take shape, the economic plan is already unfolding. The economic plan identifies Restaurants and Food as a driving force that will lead the re-introduction of Chinatown to younger Vancouverites. Although it calls for more non-Cantonese Chinese restaurants like Bao Bei, I don’t think the city could predict how diverse the new eateries opening now would be. Chinatown will be resurrected with American pies from The Pie Shoppe, German sausage from Bestie, Japanese noodles from Harvest and Westcoast cuisine from The Parker & Mamie Taylor’s. Hopefully, after the hungry have sated their appetites, they will also spend some time in the area and pickup some tea, groceries, kitchenware or eggs tarts. 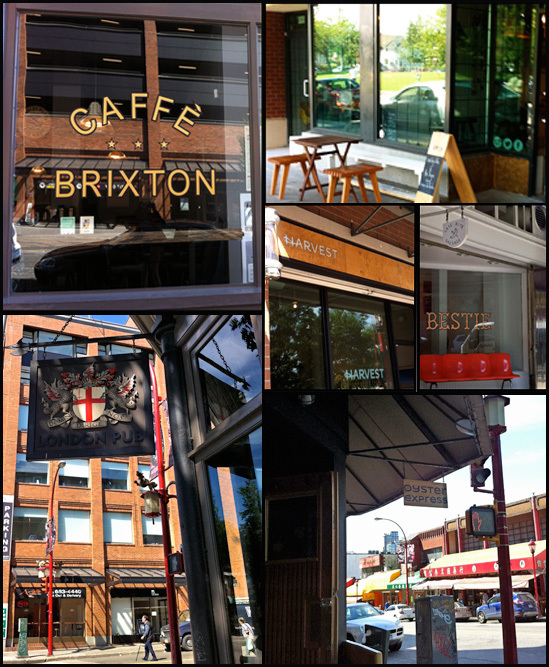 The strategy worked for Gastown, another historic area of Vancouver, which saw a revival once eateries started to line its streets and drawing a younger generation to its street. Honestly, the strategy seems fitting given how intrinsic food is to the Chinese Culture. However the specter of Gentrification looms with this plan. The last thing I want is for the older Chinese grannies who still call the SROs in Chinatown home to be pushed out of the area because it becomes to expense or too foreign for their comfort. I’ll also admit I was a little hesitant about non-Chinese businesses or hipsters (although in Vancouver there are Chinese hipsters) being the potential saviours of Chinatown as it may dilute the history and heritage of the area. 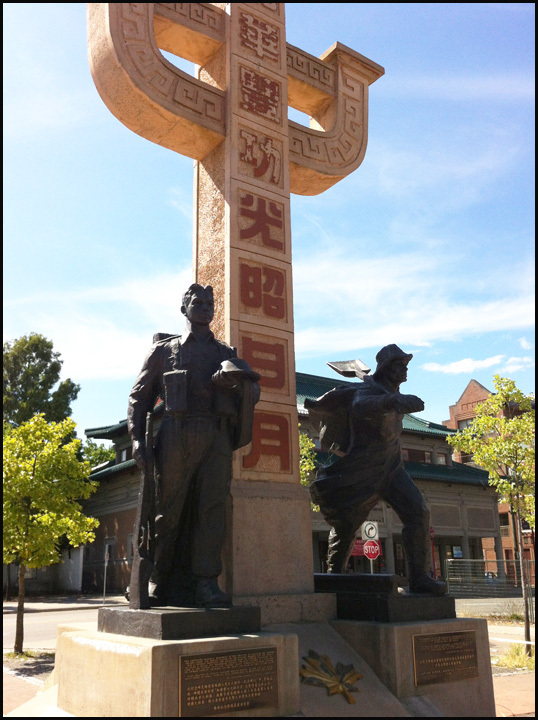 After much thought and reading, the Chinese Veterans fought to just be included and want to be treated the same, so it would be hypercritical to exclude non-Chinese business that want to set up shop in Chinatown. In the end, no matter how rich the history, if nobody is around to learn it then it will end up lost or forgotten, which is not what I want. Ironically, the Tong / Clan houses that are part of Chinatown’s heritage and the area’s historical aesthetic may save the area from truly being gentrified. However that discussion is best left for another type of blog. I’m under no illusion that those who’ll go to Bestie or Harvest will become history buffs. Even if just a handful people connect with the area’s past via the murals scattered across the neighborhood, I’ll take that as a victory. Realistically 1947 is only 3 generations ago and we should never forget those who fought for a fairer society. Be on the look out for upcoming posts about the eateries in Chinatown. Along with my regular headings, they’ll also have the following denotation, CHINATOWN, in the heading as well. You can also learn more about the Chinese Grannies who call Chinatown’s SRO home via Jackie Wong’s series in the The Tyee, by clicking here.